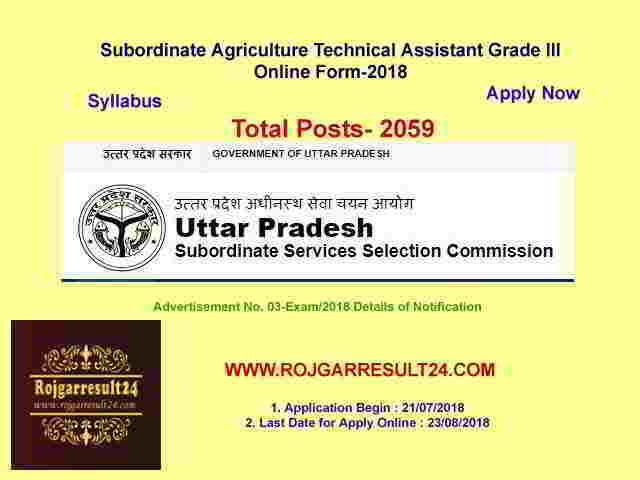 Uttar Pradesh Subordinate Service Selection Commission (UPSSSC, Lucknow) Has Open Online Application Form for the Subordinate Agriculture Service Technical Department Assistant III Recruitment-2018 Gram Vikas Adhikari, Adhikari and Samaj Kalyan Prayvekshak. Those Interested Candidates Are to the Following Vacancies and Complete the All Education and Physical Eligibility Scales Can Read the Full Notification and Apply Online Application Form. Applicants will be selected based on Written Exam Merit List.